Yesterday it was announced that after 16 years and over 500 appearances for Spanish club Real Madrid, iconic goalkeeper Iker Casillas would be leaving his native Spain to join Portuguese club FC Porto. As a small tribute to the fantastic Spanish shot-stopper, we take a look at Casillas' most defining moments with his club, Real Madrid. After going through all youth levels with "La Fábrica" (Real Madrid's youth system), Casillas at last made his debut for the senior team at the age of 18 when he faced Athletic Bilbao. 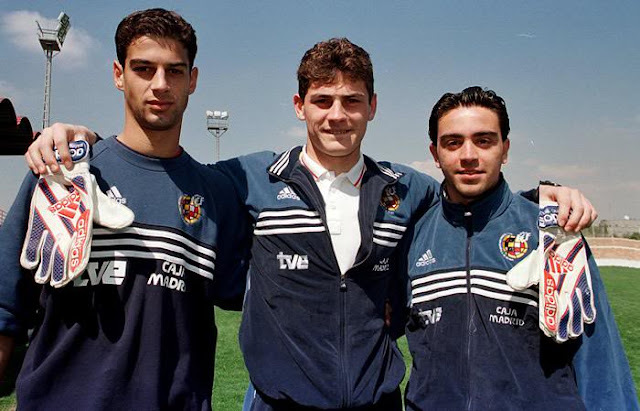 The following year Casillas would become the youngest goalkeeper to play in the Champions League Final as Madrid defeated Spanish rivals Valencia by a score of 3-0 at the Stade de France, less than one week after Iker turned 19 years of age. In his very first year with the club Iker Casillas was a Champions League finalist and champion, winning the most prestigious club title in his very first year with the senior club. Just one year after making his debut for Real Madrid Iker Casillas received his first two senior individual awards; the La Liga Breakthrough Player of the Year award and the Bravo award which celebrates the best young footballer in all of Europe and has been handed out by the Guerin Sportivo Italian magazine since the 1970's. A year after winning the Champions League, Iker Casillas would get the taste of his first ever La Liga title when Real Madrid edged out Deportivo La Coruña by 7 points to capture the Spanish title. In 2007, after having established himself as a dominant force in the world of football and having already won 3 La Liga titles, 2 Supercopa de España trophies, 2 Champions League titles, the UEFA Super Cup championship and having featured for the Spanish national team, Casillas was for the first time recognized in the UEFA team of the year list; essentially naming him one of the best goalkeepers. In 2008 led by Casillas in goal, Real Madrid would go on to win the La Liga title in spectacular goal differential fashion. The team conceded just 36 goals in 38 matches played and Casillas himself who had played in 36 of those 38 games conceded just 32 goals. For his incredible performance that year Casillas received his first and only to date Zamora Award which is given to the goalkeeper with lowest goal against ratio by Spanish magazine Marca. In 2008, a year after being included into the UEFA team of the year, Casillas was at last recognized as simply THE best goalkeeper. That year he received both the International Federation of Football History & Statistics award for best goalkeeper in the world and the UEFA award for best shot-stopper in Europe, sealing his status as "the one". In 2009 at last, Iker Casillas was recognized for that year by the international governing football body as the best goalkeeper in the world. He had to wait 12 years, but in 2011 after having been unable to reach this one trophy with his Real Madrid side Iker Casillas was a Copa Del Rey champion. From the round of 16 on, in 6 matches played, Casillas conceded just one goal and eventually defeating arch rivals Barcelona by a 1-0 final. In the two years leading up to his recent departure to Portuguese side FC Porto, Casillas managed to lead his Real Madrid side to incredible wins and numerous major trophies. In 2012 he had won the La Liga title and Supercopa de España trophy. Then in 2014 Casillas was part of a season that will always be remebered by Real Madrid supporters as one of the most succesful in club history after the team managed to capture the Copa del Rey, UEFA Champions League, UEFA Super Cup and the FIFA Club World Cup, all just before Iker Casillas would say goodbye to the club where he spent his entire career to date.